I ‘ve got some travelling and sitting around time coming up this week and have brought way too much knitting with me than is reasonable. Oh well, it made me feel better to have a few projects from which to choose. One project I brought was my latest "travel" sock. 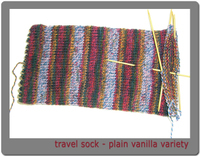 Travel sock is just an easy project that you can talk/socialize/watch a movie without screwing up royally. This sock is my plain vanilla picot edge stockinette sock. Short row heels and toes are the plan. Who saw that coming?! The yarn makes the plain sock much more fun. I’m pretty sure it’s from last Maryland Sheep and Wool and it’s Lana Grossa Meilenweit Party color 5562 in Wine Twist. It’s self striping and ragg yarn looking. Cute ain’t it? Off to sitting about waiting to be "oriented"…sigh.